Tropical rainforests are home to about 80 percent of the world’s known plant and animal species. Unfortunately, these rainforests are highly vulnerable to deforestation through both human and natural means. Depletion of the rainforests can have devastating effects on the animal life contained within. Environmental changes and loss of habitat often make it impossible for some animals to survive, let alone thrive, leading some species to endangerment and even extinction. 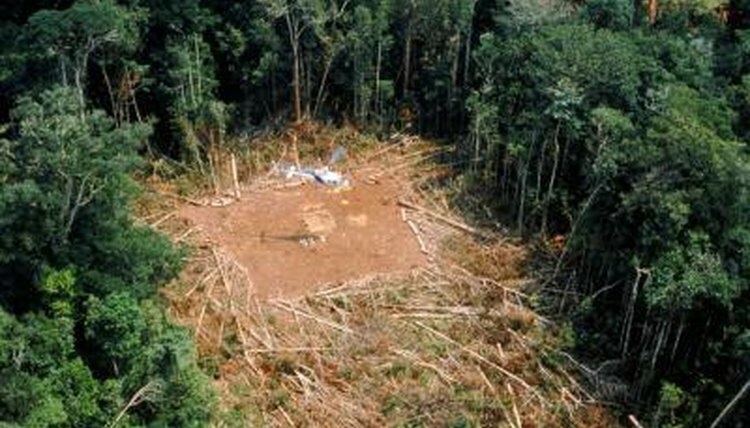 Rainforest depletion has several causes. People cut down forests to make way for urban development, or to clear land for crops and grazing livestock. Logging operations are done to collect wood for construction and paper products, and also lead to having to clear out even more forest for the creation of roads for transport vehicles. Farmers and locals collect wood for fuel and building materials. Wildfires are also responsible for deforestation, as is overgrazing by livestock, which can prevent young trees from being able to grow. One of the most devastating impacts of deforestation to wild animals is the loss of their natural habitats. Many species are so specialized to the part of the forest in which they live that they simply cannot survive the destruction of their home turf, which makes them vulnerable to extinction. Other species may be able to survive in small fragments of forest that remain, but they lose the protection from both human and environmental factors that large forests provided. Some animals also lose sources of food and venture into human-inhabited areas to find it, leading them to dangerous situations as wild animals clash with the domestic world. Even animals who don’t lose their habitats are impacted by environmental changes wrought by deforestation. With portions of the forest canopy disappearing, the forest -- and the animals in it -- lose crucial protection from the sun, which can cause soil to dry out and streams to dry up. Both animals and trees can lose their water sources, and without moisture new trees can’t grow or return water vapor to the atmosphere, which in turn causes less rain to fall. This cycle can turn what was once a lush tropical jungle into a desert climate. The forest canopy also helps to hold in heat at night, and its loss can lead to wide variations in temperature that can be harmful to many animals. Animals that lose their habitats, food or water sources, or the protection of their natural surroundings face another disadvantage: they become increasingly vulnerable to hunters and poachers. Animals venturing into human-inhabited areas are at risk of being hunted to keep down their populations and mitigate their impact on both farms and urban areas. Depleted forests are also easier for poachers to access, causing even animals who stay put in the wild to face the threat of being hunted to extinction. How Do Rodents Help the Ecosystem? What Kind of Climate Do the Okapis Live In? How Do Waves Affect Marine Animal Life? Why Are Burrowing Owls on the Endangered Species List?